Easy, quick and secure online payment. Viseca Masterpass makes paying online easier than ever before. Thanks to the solution developed with Mastercard®, you can pay in over 300,000 online shops worldwide with just a few clicks. It’s easy! If you are already registered for "one", you can get started right away. All you need are your "one" login details. You no longer have to type in your credit card information, which makes Viseca Masterpass extra secure and quick. To make a payment, click on “Masterpass” in the online shop and select “Viseca” or your bank’s logo. Once you have logged in with "one", you can choose the card and delivery address you require. You will then be forwarded to the online shop to confirm your purchase. If you are already registered for "one", you automatically benefit from Viseca Masterpass. All of your registered credit and prepaid cards are activated automatically. Manage your settings at any time in your "one" account or in the app under “Card”. Here you can see whether Viseca Masterpass is activated, and you can also change your preferred card. Don’t waste any more time entering your credit card details. With Viseca Masterpass, typing errors are a thing of the past. That makes online shopping even more enjoyable! Masterpass is offered by a growing number of online merchants as a convenient, simple and secure payment solution. Not just in Switzerland, but worldwide. Try it out now at the following online shops. 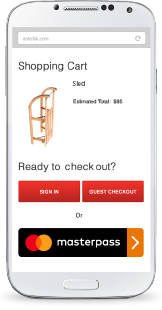 Masterpass from Mastercard is a free digital wallet that conveniently and reliably stores all your card information and delivery addresses in a secure place. Masterpass is an extremely simple, secure and quick way to make for online purchases. Register now in VisecaOne and activate Masterpass. With which credit cards can I sign up for Masterpass? You can use Masterpass with Mastercard and Visa cards. When you register for VisecaOne, the cards issued under your name (credit cards, prepaid cards, Flex cards, debit cards and business cards) are automatically activated for Masterpass. Please note that only cards issued by Viseca Card Services SA and its partner banks are eligible for Viseca Masterpass. How does online shopping with Masterpass work? Once you have selected and placed all the products you want in the shopping cart, click on “Buy with Masterpass” A list will appear showing you all the wallets available for use in Switzerland. Log in to Viseca Masterpass, then use the list to select a credit card and choose a delivery address. If you wish to use a different delivery address that is not yet registered, or if the delivery address shown is incorrect, you can add or change the delivery address during online checkout. Yes, it is. Protecting your personal data is a top priority. The data saved in the wallet are stored in Switzerland. Mastercard only forwards data on to the merchant during the payment process. The data transmission is always encrypted. Does Viseca Masterpass cost anything? No, the use of Viseca Masterpass is free of charge. Whom do I contact if I have questions about Viseca Masterpass? Please call customer services on +41 58 958 84 90. Further information is available here.